Geoff and partner, Photograph by Jonathan May. Shortlisted for the Taylor Wessing Photographic Portrait Prize 2011. 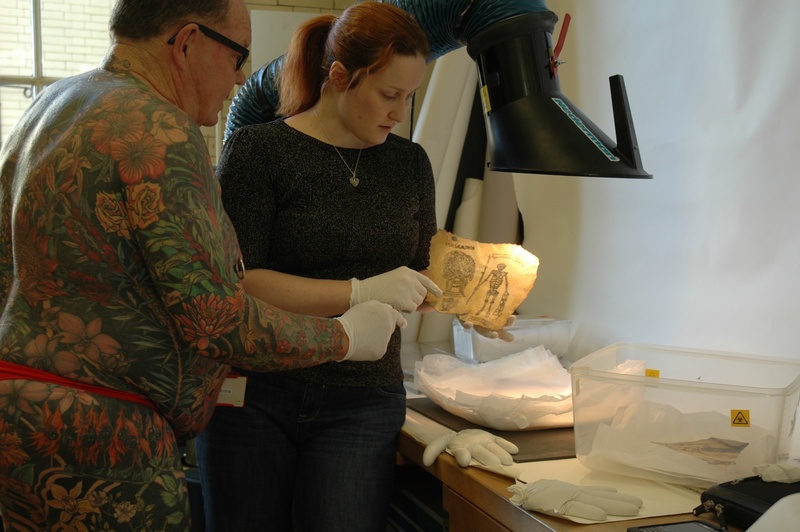 As a researcher who specialises in the preservation of tattooed human skin, I have encountered some extraordinary things stored away in archives, museums and private collections in the course of my work. But I don’t just work with the dead – I have also had the opportunity to meet some very interesting people over the years, who all have remarkable tales to tell about their tattoos, their collections, or their experiences working with human remains. One of the most interesting – and certainly the most colourful – individuals I’ve ever met is Geoff Ostling, also known as the ‘Heavily Tattooed Bear’. A retired Australian school teacher, Geoff made the decision to embark upon a full tattooed body suit at the age of 42. He first made contact with me in January 2012, when he was planning a trip to the UK to attend the Taylor Wessing Photographic Portrait Prize at the National Portrait Gallery in London. A portrait of himself and his partner, Joseph, would feature in the exhibition (pictured above). As well as spending some time at the Brighton Tattoo Convention, he was also interested in visiting the Science Museum archives to see the collection of tattoos that I was working on there. His interest was very personal, he explained, as he intended to have his entire body suit preserved after death. It’s not unusual for me to receive e-mail letters from people who are interested in having their tattoos preserved postmortem, and I am frequently asked questions about the practical process and legality of preserving human remains. But to date, Geoff is the only individual I know of who has entered into a verbal agreement with an art institution that is willing to accession his tattooed skin after he dies. Had I lived in a previous time and got tattooed by Rembrandt, or tattooed by van Dyke, or tattooed by van Gogh, or tattooed by Picasso … I think that you would think that this was something that ought to be preserved … rather than just be destroyed when I died. titled Cure For Pain, at the National Gallery of Australia. Photograph courtesy of Jim Anderson. 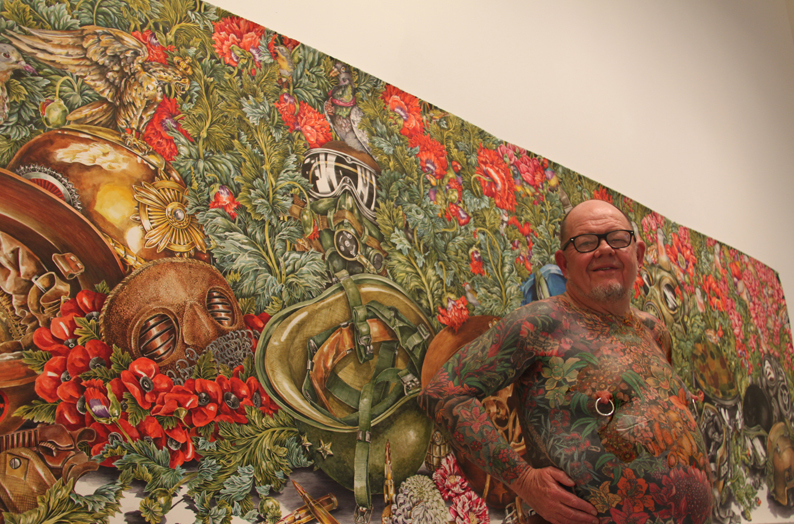 Geoff has been working with the same tattooist, Australian artist eX de Medici, for 20 years. The film covers the genesis of his body suit, from its design in consultation with a horticulturist, to his choice of artist and the development of their relationship, to the gradual transformation of his body as he is tattooed. The whole process is presented as a kind of metamorphosis, the ‘blooming’ into life of a unique work of art. In his own words, his tattoos are “all the flowers, both native and exotic, that grow in a Sydney garden … the body suit is original and it is all drawn from nature.” Watching the documentary, it becomes clear to me that both Geoff and the curators of the National Gallery of Australia who have agreed to acquire his skin, very much view his tattoos as artworks like any other. But are tattoos ever really artworks like any other? I suspect that the artist, eX de Medici, may also question this notion when she comments that, “the radical difference between an art practice and tattooing is that it’s not for you – its got to be about them. All you’re doing is facilitating something they need.” How she feels about her tattoo work being collected by the gallery – which already owns many of her paintings and drawings – is barely touched upon. I wonder too, how Geoff will relate to the Wellcome Collection tattoos that I work with, which were neither made by skilled tattooists with artistic reputations, nor preserved according to their wishes, but rather taken to satisfy the collecting interests of other people during the 19th century. With Geoff Ostling at the Science Museum archives in Kensington Olympia, London. January 2012. When we arrive at the archive, Geoff is immediately in his element. I give him a pair of latex gloves and get out the first box of tattoos. He is fascinated by them, and all of the questions he asks me are familiar questions that I asked myself when I first began working with them: Who were these people? Who were the tattooists? How were they made? What was the significance of this or that tattoo? How did they feel when they got this tattoo? The answers to most of these questions will of course never be conclusively answered. Most of the tattoos were produced by amateurs, with whatever materials were available to hand, and much of the iconography speaks of military and seafaring life, travels abroad, love and death. These people did not consent to have their tattoos preserved, but were instead a subject of interest to criminologists and physicians, many of whom viewed tattooing not as art, but as a primitive sign of moral deprivation. The lives of these 19th century tattooed men are a million miles away from the artistically accomplished and respected tattoo profession of the 21st century. But I’m still wondering about what drives him to want to have his skin flayed from his body and preserved after death – something that many people would regard as morbid, or even horrifying. Does handling the tattooed skins of others make the reality of what he intends to do any more visceral? Geoff is philosophical about it – he compares the revulsion some people have when they hear about his plans to the unease many people feel about donating their organs after death. In some sense, then, he sees having his skin preserved and displayed for others as a personal donation which has intrinsic value – artwork to be enjoyed, skilled preservation to be marvelled at, something which will inspire fascination as much as revulsion. Becoming an artful curiosity after death doesn’t seem to daunt him – in fact, he already enjoys showing off his tattoos at conventions around the world, and readily undresses to show me his full body suit as soon as we arrive at the archive. Geoff tells me that his tattoos are his most valuable possession, and he is evidently proud of them. It seems a fitting legacy that his brightly decorated skin should be preserved and put on public display in an art gallery. As we look through the boxes filled with human parchments, one strikes us both as particularly resonant: it is a fairly large fragment, most likely from a chest, tattooed with the figure of a grim reaper clutching an hourglass in one bony hand, and a scythe in the other. Next to this is an image of a tombstone beneath a weeping willow. Above the image the phrase pense a moi is tattooed – “think of me”. Geoff and I reflect on this memorial tattoo – as well as commemorating the loss of a loved one, it also seems to speak of the awareness this person had of their own mortality. The tattooed phrase is especially poignant – we will never know who this person was, and they could never have imagined that we would be reading their tattooed sentiments, a hundred years after they died. Is this a part of Geoff’s motivations – a desire for some part of himself to live on after death? He tells me that he believes that human desire for some form of immortality is a universal urge, and it seems fair to say that it is not just eX de Medici’s art that he wishes to preserve beyond his own lifetime, but the most significant piece of his physical self, too. Showing Geoff one of the memorial tattoos in the collection. As with everything else, Geoff has contingency plans in case of this eventuality. “If the NGA decide not to accept it,” he tells me “my skin should be offered first to the Powerhouse Museum in Sydney and second to MONA in Hobart. If no Australian Art Gallery or Museum wants it, it could be offered to the Wellcome Museum. It will be at the discretion of my partner, assuming he is still alive, and to my executors, with the condition that it is displayed from time to time.” If Geoff’s tattooed body suit were to end up in the Wellcome Collection, it strikes me that this would be an interesting, if slightly incongruous, footnote to the history of tattoo collecting. Both his attitude towards tattoos and his motivations for having them preserved couldn’t be more different from the context in which the 19th century specimens were collected – but they are nevertheless a source of inspiration to him. To Geoff, these crude tattoos are art too, though perhaps not the work of ‘great artists’ like Rembrandt, van Gogh, Picasso – or even eX de Medici. There is no doubting that the surge in the popularity of tattooing, along with an influx of artistically trained tattooists to the profession, is driving innovation in the art form – perhaps Geoff is simply ahead of a trend, and we will see a lot more preserved tattooed flesh in the art galleries of the future. Whether or not tattoos may be rightfully considered works of art like any other, for Geoff and the growing numbers of people like him who wish to preserve their ink after death, it is no longer assumed that the tattoos they collect during their lives must necessarily follow them to the grave. This post was first published in the May issue of Things and Ink magazine. You can read more posts in The Tattoo Collectors series here. Jim Anderson’s photography and fine art website can be found here. Jonathan May’s photography can be viewed on his website here. This entry was posted in Contemporary Art, Contemporary Preservations, Tattoo Iconography, The Tattoo Collectors and tagged art collectors, bodysuit tattoos, contemporary tattoo collecting, contemporary tattoos, eX de Medici, film, Geoff Ostling, living tattoo donors, memorials, National Gallery of Australia, preserving skin, the tattoo as art. Bookmark the permalink. I know Geoff personally as a good friend and this is a wonderful documentary about a wonderful man. While I don’t know that it will ever be possible to preserve my skin as Geoff is planning to do, like Geoff I am also on the path to getting a full body tattoo. At 52, I’m just getting started on my bodysuit and have started on my backpiece. My theme is on the endangered wildlife of the world, focusing on the animals of the rainforests and jungles. Ironically, man is killing the animals that could be killing man by either poaching, over-hunting them, or encroaching upon their habitat. I would like someone to document my tattoo and the process so in the event it may be possible to have my skin preserved, there would be a story to go with it. I can’t believe I’ve never heard of this guy! What a great plan, I have a lot of respect for him turning his whole body into a piece of art. Very nice.